Touchworx Group Inc. and Philippine Educational Theater Association (PETA) celebrate the 10th anniversary of one of the country's most iconic Filipino musicals with Vincent De Jesus and Ricky Lee's Himala: A Celebration of the Musical, a concert featuring the well-loved songs from the musical Himala, Ang Bagong Pagtingin sa Mukha ni Elsa. Directed by seasoned PETA director, Soxie Topacio, the concert will be staged at the PETA Theater Center on March 15-17, 22-24. Topacio was also the director of the musical ten years ago. 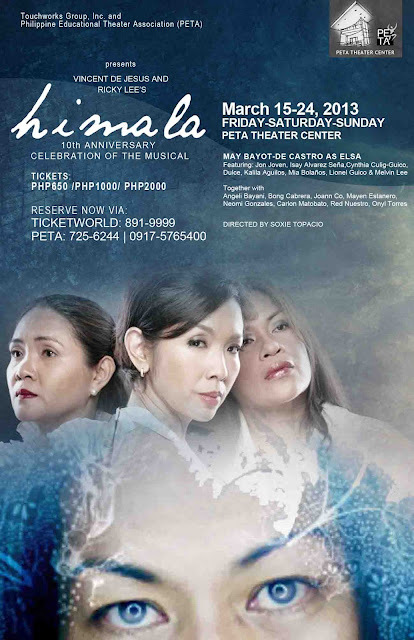 Himala, Ang Bagong Pagtingin sa Mukha ni Elsa explores man's never ending quest for something and someone to believe in. It takes a whole new spin on defying old boundaries in a genre-bending musical meets contemporary dance and dares us to look into the face of legendary heroine Elsa in a new light. The concert features the songs from the musical, such as "Walang Himala" and "Gawin Mo Akong Sining" both sung by Mae Bayot-De Castro as Elsa, "Kami ang Tunay na Birhen" by Isay Alvarez-Seña as Nimia, "Magpakita Kang Muli" by Cynthia Culig-Guico as Chayong. This rare celebration of a well-loved Filipino musical features the stirring voices of Isay Alvarez, Cynthia Culig-Guico, Dulce, Kalila Aguilos, Jon Joven, Mia Bolaños, Myke Salomon, Lionel Guico, Melvin Lee, and May Bayot-De Castro as Elsa. It also showcases the talents of theater stalwarts: Angeli Bayani, Bong Cabrera, Joann Co, Mayen Estañero, Neomi Gonzales, Carlon Matobato, Red Nuestro and Onyl Torres as the voices of Barrio Cupang, with live piano arrangement by Jed Balsamo. Tickets are Php650 (balcony), Php1000 (orchestra) and Php2000 (elevated orchestra). For ticket inquiries, contact PETA at (632) 725-6244, 0917-5765400, +63.918.9005370 or TicketWorld at (632) 891-9999.